Global Contact Lenses Market size was worth over USD 9.5 billion in 2016 and will surpass 1 billion units by 2024. 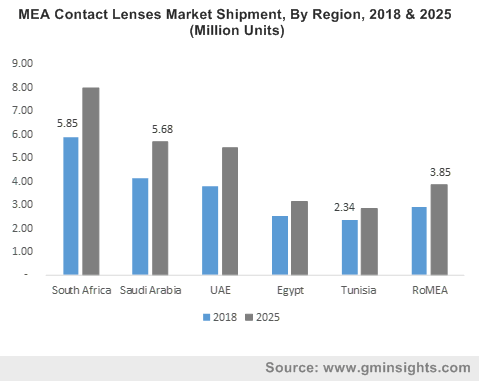 Changing consumer lifestyle coupled with ongoing fashion trend will drive contact lenses market growth. Increasing prevalence of optical disorders such as myopia and hypermetropia will propel the industry size. Strong product demand to change aesthetic appearance without vision correction will support cosmetic lens market penetration. According to per the National Eye Institute estimation, in 2014 over 2.9 million Americans had suffered from low vision (<20/40) and an estimated 5 million Americans are projected to have low vision by 2030 In 2015, the U.S. Centres for Disease Control & Prevention report, estimated there over 40.9 million contact lens wearers, with 18 years of age and older, accounting for 16.7% of country’s adult population. Rising population suffering from ophthalmic disorders, weakened eyesight and refractive errors owing to birth defect, trauma, or infection will boost the market size. Factors such as clear peripheral vision, elimination of glare, and easy to carry benefits will fuel product demand. Easy availability of coloured, affordable and disposable varieties led to the increased usage of the product. Emergence of innovative products along with technological advancement will boost the product market size. Raw materials prices including hydrogel and polymers is the key factor affecting contact lenses market price trend. However, increasing acceptance of corrective procedures like LASIK and Photorefractive Keratectomy (PRK) and ophthalmology devices may hamper the product market growth. Further, substantial risk of infection & corneal ulcers leads, dryness of eyes and poor fitting are the major factors that demotivate people for continuous usage. Soft lens accounted for more than 80% of the total market share in 2016. Benefits including better oxygen permeability and convenience in carrying has positively influenced product demand.The product also ensures comfort during sleep owing to its silicone hydrogel content. RGP was valued at over USD 2 billion in 2016. Better vision & durability, improved deposit resistance and cost advantage in the long term are the key factors driving product penetration. More flexibility as compared to soft lenses along with efficient retention ability will enhance product demand over the forecast period. Increasing prevalence of keratoconus and astigmatism will propel the usage of hybrid lenses among consumers. Rising demand for sustainable and durable material for manufacturing innovative products will support the industry growth. Hydrogel material generated over USD 7 billion revenue in 2016. High initial comfort, visual acuity, simple to fit, little adaptation and minimal spectacle blur are the major factors driving this segment’s growth. Shifting consumers focus towards the product owing to its competitive price, increase in hypoxia-related problems and easy handling will support the industry demand. However, increased chances of bacterial contamination & care time and limited correction possible may affect hydrogel material segment. Polymers material is estimated to register over 250 million units in volume by 2024. Improved flexibility, easy to manufacture & clean, hydrophilic nature, easy availability of raw materials and suitable refractive index for bending light rays are the factors supporting this segment’s growth. Optical stores accounted for more than 20% of the total distribution channel segment in 2016. Offering services by optical stores including eye check-up facility and consultation are the key factors driving demand from this segment. Independent brand showrooms generated over USD 2 billion in 2016. Increased brand awareness among consumers has motivated numerous manufacturers including, Acuvue and Air Optix to opt for independent showrooms. Spherical design segment dominated the overall design segment in 2016. Emergence of automation technology will drive cost effective and bulk production of product. Globally, increase in number of myopia and hypermetropia patients will propel the industry size. As per studies nearly 30% of the population is myopic and it is estimated to surpass 50% by 2025. Bifocal and multifocal design is set to witness significant gains. Ability for incorporating multiple prescriptions is projected to witness increased product demand. Age-related vision disorders and high incidence of presbyopia are the key factors fuelling the product demand. North America prosthetic lens will be valued over USD 450 million by 2024. Improved appearance of eyes, that is being disfigured by eye diseases, birth defect, injury or trauma will propel the product demand. In some cases, they can even assist in light reduction into the eyes for those with the light sensitivity problem. Corrective lenses accounted for over 40% of the global market share in 2016. High comfort offered to the consumer facing hay fever and fry eye has stimulated product demand. Suitability in wearing it for outdoor activities or sports in any weather conditions are major factors driven product demand. Daily disposable usage segment in Germany accounts for over 15% of the overall industry share. Better vision properties coupled with ease of use and throw option has increased the product demand. Drawbacks associated with bi-weekly and monthly lenses including, deposition of calcium and hairspray deposits is expected to facilitate demand for daily disposables. However, high price trend may pose a challenge for this segment for short term. Asia Pacific contact lenses market will witness growth over 4% up to 2024. Increasing disposable income along with economic growth is the key factor supporting the industry growth. In addition, non-standardization among practitioners owing to usage outdated equipments for prescription in developing economies including, India and middle east countries will open new avenues for regional industry growth. North America contact lenses market registered over 390 million units by volume in 2016. Increasing geriatric population and rising health awareness for better eye care will augment the product demand. U.S. has reported more than 40 million people aged over 65 in 2016. 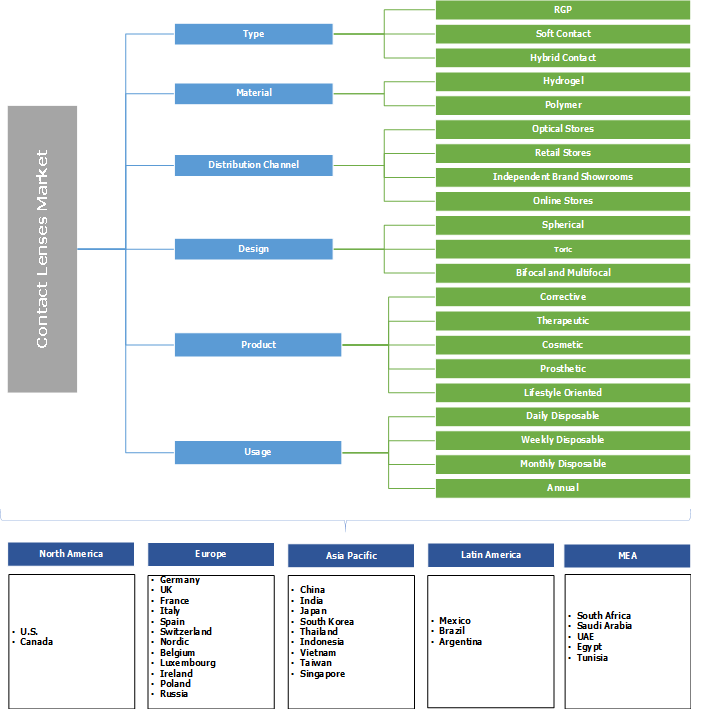 Global industry share is partly consolidated with the presence of few multinational players. Cooper Vision, Johnson & Johnson, Novartis and Valeant Pharmaceuticals are the major industry players accounting for a major industry share. Key manufacturers in the industry have created various solutions such as combining the corrective technology with the eye highlights & colour blends to cater to needs of the patients. For instance, ACUVUE’s 1-day define lens has a distinct layer of outer dark ring with translucent patterns that add up to depth of eye, thus enhancing eye colour & shine. Other notable manufacturers include Blanchard, Contamac, Hoya, Essilor, Zeiss International, Conforma, Bausch & Lomb, Menicon, UltraVision and Wesley Jessen. Production capacity & product portfolio expansion, mergers & acquisitions and joint ventures are the major strategies adopted by the companies to gain competitive advantage over the forecast period. Contact lens is a thin material that is placed directly on the eye surface, widely used for vision correction, therapeutic and cosmetic purpose. Since they are worn directly on cornea of the eyes, it is important to handle them with exceptional care for preventing eye ulcerations, infections and other eye diseases. Thus, it is a widely known fact that the careless storage or handling of the product and sleeping with lens on can cause severe implications. This remains as a significant challenge hindering large-scale usage of the product among the sceptical consumers. Furthermore, regular attempts are made by manufacturers for educating masses regarding its benefits and ease of use.